Trapped inside an armored transport rail car, you are riding on a runaway train bound for destruction. Your only chance is to make it to the back of the train and jump. 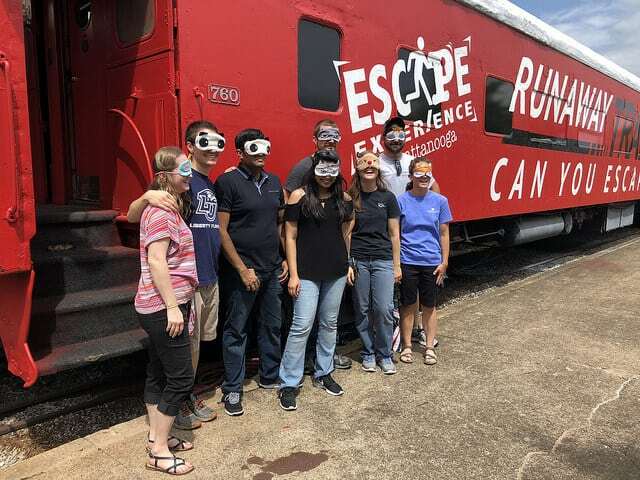 Runaway Train Transport is one of a kind as it takes place on an actual train car at the Chattanooga Choo Choo. With accompanied visuals and sounds, this scenario borderlines on a simulation as passengers are stuck on an unstoppable locomotive. You inadvertently got mixed up with the mob and want out. Six months ago in exchange for amnesty and a new identity you agreed to testify against one of the most powerful crime bosses in the United States, Joseph Guarino. Your life in tremendous danger. You and your loved ones have been placed into the Witness Protection program, and have been in hiding ever since. As Marshalls, we have determined the safest and most secure way to transport you to the court hearing is via an old armored cargo train. Nobody will know of your whereabouts and after the hour long train ride to Eagleton City, you will be able to testify in a court of law against this crime Boss, and help put him behind bars for good. All of the information regarding your case must be guarded very carefully. Not even you can know the route you are about to take, so the to ensure your safety, you will be blindfolded. Secretly stowed away in this inconspicuous cargo train, you patiently wait to arrive at Eagleton City where you will act as a key witness in the upcoming trial. But unbeknownst to you and your fellow passengers, this train was never meant to make it to the end of the line. It would appear your cover has been blown and your identities revealed. With the doors locked, and the train’s speed rising, can you escape off of this runaway train before it’s too late? To learn more about this incredible scenario, click the link below.